The Economist's April 20, 2011, report on China and Africa (with the catchy subtitle "Africans are asking whether China is making their lunch or eating it") gets a lot of things right, but some big things wrong. As I noted in an earlier post, it is also prone to exaggeration. What the reporter, Oliver August (he emailed me while he was working on the article but I was in Ethiopia and we never managed to talk), got right was a generalized sense that lower standards, lack of "corporate social responsibility" (social and environmental) in business practices, poor labor relations, competition with import substitution industries (especially textiles), and not enough hiring of local labor are the downside of China's increasingly prominent presence in Africa. These are serious issues and rightly tarnish the general reputation of China in Africa. I've written about them all in The Dragon's Gift. 1. The Economist: "For investment in African farming, China has earmarked $5 billion. A lot of Africans view this anxiously." Wrong: Sigh. This myth is a hard dragon to slay (so to speak). I wrote about the legend of the (non-existent) $5 billion fund for agriculture here in April 2010 after reading Howard French's Atlantic article that made this surprising and erroneous claim. Yes, China Africa Development Fund plans to raise $5 billion for Chinese equity investment in Africa (they've raised only $1 billion so far), but this is going into all sectors: infrastructure, manufacturing, energy, mining, and agriculture. The mistake that this fund is devoted to agriculture has become one of the urban legends circulating around the internet, a "rural legend" we could call it. 2. The Economist: Chinese construction work can be slapdash and buildings erected by mainland firms have on occasion fallen apart. A hospital in Luanda, the capital of Angola, was opened with great fanfare but cracks appeared in the walls within a few months and it soon closed. The Chinese-built road from Lusaka, Zambia’s capital, to Chirundu, 130km (81 miles) to the south-east, was quickly swept away by rains. Exaggerated: I've analyzed stories about the Luanda hospital and the Lusaka-Chirundu road before in this blog. True, both had problems (the hospital was opened in February 2006 but rather than "falling apart" in a few months, it developed significant cracks over the first four years, and closed for repairs in June 2010). The Economist implies that the entire Lusaka-Chirundu road was "quickly swept away by rains". This did not happen but the road did develop a cave-in along what appears to be a 20 foot section. For more on this from several Chinese, Africans, and others see the comments on my post. 3. The Economist: At Chinese-run mines in Zambia’s copper belt they must work for two years before they get safety helmets. Ventilation below ground is poor and deadly accidents occur almost daily. To avoid censure, Chinese managers bribe union bosses and take them on “study tours” to massage parlours in China. Obstructionist shop stewards are sacked and workers who assemble in groups are violently dispersed. When cases end up in court, witnesses are intimidated. Source: Mines Safety Department [in Simutanyi, "Copper Mining in Zambia," July 2008]. *Includes the 50+ workers who were killed in the notorious BGRIMM dymanite factory explosion at the Chinese-run Chambishi mine. Although the data stops in 2006, it covers the worst years with regard to Chinese safety practices (see below). A 2009 Norwegian academic study of an unnamed international copper mining firm in Zambia (not the Chinese company) reported that it had experienced 20 fatalities between January 2005 and May 2007. Any fatality is one fatality too many, but it does no favor to our efforts to understand the reality of Chinese engagement to exaggerate their record. I didn't look into the massage parlour claim (sounds plausible) but on the other safety aspects I asked Dan Haglund, a British scholar who has done extensive fieldwork on the Chinese copper mines. He was unaware of any practice that miners "must work for two years before they get safety helmets." He told me "the first Zambians working at NFCA after it started operating in 2003 may well have had very limited safety equipment during the first couple of years. However employees as well as regulators agree that standards have improved significantly since then - albeit from a low base." From another researcher, I learned that the Chinese in the copper belt do issue required safety equipment on a regular basis, but are reluctant to replace boots or helmets that are damaged before the scheduled replacement period. About court cases, Dan Haglund reported that in his experience, the Chinese in the copper belt tended to ignore many labor regulations, for example, they would dismiss personnel without giving notice. However, he said, "my impression is actually that the court usually rules in favour of the workers. The Company Secretary said that this was one of the company's concerns regarding operating in Zambia - saying that in Zambia, if there is a dispute, the courts will always rule in favour of workers." 4. The Economist quotes (without comment) Sanou Mbaye, formerly a senior official at the African Development Bank, who said "more Chinese have come to Africa in the past ten years than Europeans in the past 400." Exaggerated/Wrong. A nice quote but without being unkind, I venture to say it is complete balderdash. No one has figures on how many Chinese have come to Africa. We often hear estimates of 750,000 or a million, or even more. But any estimate pales in comparison to the numbers of Europeans who came to Africa during colonialism and who live and work there even today. Nigeria and South Africa are favorite destinations for Chinese traders and immigrants. And there may be more Chinese than Europeans in Nigeria. But could anyone who lives in South Africa or visits frequently, as I do, claim that there are more Chinese than Europeans in the airports, or even on the streets of South African cities and towns? Estimates of Europeans in Africa during the colonial period vary, but a long and pretty well documented Wikipedia overview of "White Africans of European Ancestry" might surprise Mr. Mbaye. The article estimates that the population of Europeans in Africa rose to perhaps 10 million during the colonial period, and remains (at most) at 6.5 million. While I will leave it to others to examine the sources, the article cites research claiming that in South Africa in 1995, there were some 5.2 million "Europeans" while Algeria had over 1.6 million Europeans in 1960, the Portuguese colonies in Africa had some 650,000 Portuguese before independence, Libya had over 150,000 Italians; Tunusia and Morocco had 750,000 Europeans, at the peak there were some 296,000 Europeans in Zimbabwe. 5. The Economist: Suspect above all is the type of transfer that China offers to African countries. Most loans and payments are “tied”—ie, the recipient must spend the money with Chinese companies. (Japan, Spain and others followed a similar model until fairly recently.) But tied aid leads to shoddy work. With no competition, favoured firms get away with delivering bad roads and overpriced hospitals. Creditors and donors often set the wrong priorities. However, this discussion of "tied aid" is beside the point: what the Chinese are primarily providing to African governments is not aid, but commercial-rate export credits. And no OECD country provides untied export credits. That would defeat the purpose of this government tool for increasing exports. Members of the Development Assistance Committee at the OECD reported in 2009 that they had committed $24.8 billion in "other official flows"* to developing countries (this is in addition to official aid). We don't have a "tying" report for these transactions, which are the appropriate comparison for the Chinese non-concessional official flows. 6. The Economist: The Democratic Republic of Congo was persuaded at the last minute by international advisers to scale back a Chinese lending facility from $9 billion to $6 billion. Exaggerated/Wrong. This sounds as though international advisers came in "at the last minute" as the DRC was about to make a huge mistake. What really happened was a stand-off lasting nearly two years between the DRC and its creditors, which were refusing to consider debt reduction for the DRC unless it reduced the size of (and official guarantees for) a Chinese credit package linked to a joint venture mining investment. What this meant for the DRC (in addition to a lower debt) was that the benefits it will get from the Chinese consortium in exchange for the mining rights were reduced by $3 billion. (The mining venture was going to finance $6 billion in reconstruction infrastructure projects, unlinked to the mine, in addition to $3 billion for the mine). For more on this complicated story, see this note by researchers Johanna Jansson and Wenran Jiang for Pambazuka. I'm leaving for a CSIS/CIIS meeting in Beijing tomorrow and then on to conferences/speaking engagements in Brussels, Copenhagen, and Dresden. Thanks to the Great Fire Wall, likely won't be blogging again for awhile, but I'll be interested in readers' comments on my take on The Economist. *other official flows: "Other official flows are official sector transactions which do not meet the ODA criteria, e.g. : i.) Grants to developing countries for representational or essentially commercial purposes; ii.) Official bilateral transactions intended to promote development but having a grant element of less than 25 per cent; iii.) Official bilateral transactions, whatever their grant element, that are primarily export-facilitating in purpose. This category includes by definition export credits extended directly to an aid recipient by an official agency or institution ("official direct export credits"); iv.) The net acquisition by governments and central monetary institutions of securities issued by multilateral development banks at market terms; v.) Subsidies (grants) to the private sector to soften its credits to developing countries [see Annex 3, paragraph A3.5.iv)b)]; vi.) Funds in support of private investment." Source: OECD/DAC Statistics. THANK YOU for taking the time to thoughtfully consider the Economist article. I read it after reading your book, but I couldn't necessarily point out the exaggerated facts. This blog post really clears a lot of things up for me, and I am going to go back to the Economist article and re-read it with new eyes. Thanks for the piece. That they kept the Sanou Mbaye quote in tells all you need to know about the Economist's Africa reportage. Thanks for posting this. Reading the Economist article had really darkened my view of China in Africa, this has lightened it. That is very knowledgeable of you Prof. Brautigam! I really enjoy reading your blog. To Bounded Irrationality: it's readers like you that I hope to reach. Thanks for your comment. I am pretty amazed to see how this blog has changed from a source of information about China and Africa to an apparatus to dismiss Western reports about China in Africa. My point is: why Professor Brautigam never comments on Xinhua or Renmin Bao reports. Why does she always assume Chinese authorities or media say the truth? Criticize the West –specially when we enjoy the West way of life- for what it did or does in the World has been à la mode for over 30 years, that is nothing new and sometimes is fair, but I think researchers, when talking about China in Africa, should first have some knowledge about China itself (ie spend a considerable amount of time living in the country, not a couple of weeks in Sanlitun restaurants). The Economist might be wrong in some assumptions, but I wouldn’t dismiss some of their concepts. For instance, how local workers in areas like DRC Lubumbashi or Luanda (or Mozambique Xai-Xai, or Cairo, or Zambia...) are disappointed with China (I mean, Chinese companies, and yes, we do have to include also the SOE) for what they perceive as at least unfair labour practices. That is a fact and one only need to all these places to realize about it (instead of sending your diligent Chinese assistant). All these points of views (the locals workers, the African NGOs...) are excluded of your blog and your book, where surprisingly you also dismiss Western media reports but, the next page, you quot without reserves Xinhua. I guess that their information is what you call “The Real Story”. Dear 马康 -- thanks for your comments. I started my post on the Economist by emphasizing many of the areas that the article got right, and unhappiness with labor relations and low standards of all kinds are among the top contentious issues between Chinese and Africans. I don't spend time dissecting Xinhua or Renmin Ribao stories because who in the west reads or relies on them? On the other hand, I subscribe to The Economist, read it weekly, and rely on it to be pretty accurate. So it bothers me it gets some important things wrong on a topic I know something about. And that provokes a blog posting. Although it might have been nice to send a "diligent Chinese assistant" to Africa so that I might avoid traveling by public buses on pot-holed rural roads, on Russian helicopters without seat belts, motorcycle "bush taxis", and through Eastern Nigeria chaperoned by kind strangers toting AK-47s, I did my own field research. The Economist maybe (or maybe not) got a couple of ideas wrong or exaggerated, but why don't you underline at this point that labor conditions offered to locals in Africa by Chinese SOEs are just grotesque, clearly the worst? I find this technique of blowing away any critical Western media reports on China, giving credit to the regime's mouthpiece and minimizing the reality when evidence is indisputable, quiet disturbing. Anyway, on the labor issue, your silence undermines the authority of your whole views on China-Africa, I'm afraid. I don't argue you didn't do field research in Africa. Another thing is if, on the way to meet Chinese businessmen or Ambassadors all across Africa, you thought about stopping for a chat with miners, provincial authorities or activists from NGOs. If you went to the locals workers homes to experience, in first person, the “gift of the Dragon” to the Africans: the lowest salaries and, eventually, the poorest labor conditions among all others. These perspectives are important to understand the concerns of Africans (common people, not the elite) vis-à-vis the Chinese. By excluding them from the debate, by giving so much voice (and veracity) to the Chinese official perspective (that is, to the propaganda), by systematically dismiss the Western media reports, you are reinforcing the myth (to many Africans, at least) of the “Dragon’s Gift”. You said: "why don't you underline at this point that labor conditions offered to locals in Africa by Chinese SOEs are just grotesque, clearly the worst?I find this technique of blowing away any critical Western media reports on China, giving credit to the regime's mouthpiece and minimizing the reality when evidence is indisputable, quiet disturbing. " My point is, we have enough stereotype from western mainstream media regarding China/Africa relationship that has painted a distorted picture in average population's minds. What professor has done most of the time is just revealing the other side of the story. Did the professor said anything untrue? If yes, you can argue and list your researches; if not, or if you just want to hear/see the black side of the story, why not ignore this blog and read only the main stream media? If there is something I cherish about the emergence of China in Africa is this sudden attention to labour conditions in mines, agriculture and various sectors in African countries. I happen to be a researcher working on labour markets in Africa (Mozambique, Senegal, etc. ), particularly rural labour markets where one finds the most appalling conditions of employment possible to imagine (yes, worse than your sweatshops in Vietnam and China...). Suddenly activists, reporters, researchers come out of their caves and scream about labour conditions in Chinese entreprises. This is great. Now, let me suggest the next steps: (1) collect some comparative information on labour conditions across sectors and employers; collect information on labour conditions in agriculture, 'nice' jobs offered by African smallholder farmers to local casual labourers who might be lucky to get a soap and a few cents for a whole day of back-breaking work in their fields; 'lovely' jobs offered by many African and non-African entrepreneurs in the spreading micro-entreprises of the slums of Nairobi or Dar es-Salam (start with child workers in the private transport minibuses); even better jobs offered by national employers in mining in DRC or Tanzania; and so on. (2) once you have this empirical information, compare and assess the main determinants of appalling labour conditions across the board; (3) denounce and assist trade union organizations to get their act together and fight for non-militant labour against both national and foreign employers. If that happened, millions of casual African wage workers would be eternally grateful. So, I thank Chinese entreprises for investing in Africa with their dodgy labour practices because at least they have stirred some interest in the conditions of labour in Africa. They're on the spot and finally someone asks what's going on with vulnerable wage workers in mines, etc. Unfortunately, my hunch is that many of those who focus their anger on these particular foreign investors (why not all foreign investors ?) actually don't care much about the plight of these millions of workers across sectors and employers. Rather, their apparent sensitivity towards labour conditions belies a petty nationalist agenda. "Rather, their apparent sensitivity towards labour conditions belies a petty nationalist agenda. " ^ I definitely see it too. 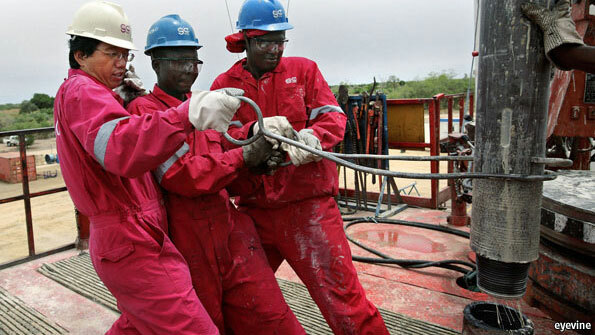 I worked with ONEP (oil workers' union) in Gabon for several years 2004-2007 in labour/media relations and we would try to get international attention to the workers plight on overpay and local hiring practices with limited success. This really changed when a friend at ONEP contacted me in late March this year for some advice because they had decided to strike again and they were being bombarded with questions from all the international media. According to my friend this new found attention started shortly after Yang Jiechi paid a visit to Libreville in February to begin talks on closer economic cooperation. Most poignant was that many questions regarding the strike focused on how future Chinese labour practices might impact strikes and labour unions. But my friend was estactic with all the attention and he's definitely not complaining. It seems the European still haven't got it right. China in Africa is not only for natural resources, they do not particularly like to deal with undemocratic regimes, and, it's NOT a one way traffic. They are there for business, and the business is not imposed but negotiated. If European can't learn from this, they are unlikely to be successful in the future. "Revealing the other side of the story"? No, thank you. What I want to read is the reality of things, but what I find quite often is a focus -only- on the "other side" of the story, which ends up showing a very distorted picture. The problem here is not what's been said, but what's been silenced. And blaming "main stream Western media" is quite a common technique when evidence is presented, that's in fact what the CCP does (I am assuming you're not a Party member). Just end up saying that if I make those remarks, it's because I have evidence and research of my own. And based on that, I disagree with the Africa-China love story. That's not what I've seen on the ground. "The problem here is not what's been said, but what's been silenced." -- Totally agreed. It's called Yellow Journalism. Quite a common practice on Africa-China reporting, IMHO. Thanks God we have Xinhua and CCTV, as well as the opinions of 'experts' like Li Anshan to enlighten us about what really is going on. Actually I thought the Economist piece was wonderful. And Deborah's analysis - pointing out the whole road didn't wash away, etc. - often comes across as officious. In taking issue with the quote by Sanou Mbaye about more Chinese coming to Africa in the last 10 years than Europeans came in 400, she omits the fact that the Economist journalist in no way seems to be suggesting that that number is accurate; but rather to prove how "under siege" some Africans feel. As someone who lives in Africa and has traveled rather extensively around the continent, I must say this was one of the best reports I've read on the role of the Chinese. Could it be that Deborah takes the Economist piece personally and her analysis is tainted, because she perceives it as competition to her on the subject of China in Africa? The Economist was insinuating both the hospital was closed permanently and the connecting railroad washed away permanently. This imagery was not so subtly suggesting that the Chinese basically left no hospital and no railway in return for natural resources. That is misleading and consistent with the ominous tone and narrative of the Economist article. Concerning the Economist quote of Mbaye that more Chinese have shown up than all European colonialists over the past 400 years, that was a clear cut statement that if uncorrected would continue the ominous tone and narrative of the Economist article that was riddled with exaggerations and inaccuracies. Those are the hallmarks of yellow journalism and something Deborah does a fantastic job of exposing. Kudos to her. James, I couldn't agree more. I subscribe to The Economist and it is very disheartening to see them get some things so wrong on Chinese engagement in Africa.I tend then to read other articles in The Economist wondering which of their claims I can believe and which I should take "with a grain of salt". Thanks for your comments. Here's what a human rights researcher with experience in the copper mines in Zambia told me yesterday regarding the Zambia claims in the article: "A lot of this is absolutely absurd. Deadly accidents almost daily? Zambians are long enough in the copper industry that you’d see massive riots if that was the case." He also said: "When cases are in court, you see more bribing of witnesses, complainants, and (probably, though I didn’t document this directly) judges than you see intimidation. Threats of terminated employment with some frequency, which would be intimidation. But often they find it easier just to give the person the equivalent of $50 to not bring the complaint in the first place. And the two years before safety helmets is again just factually wrong. I don’t know, maybe that’s the practice at 15MCC – the group that does subcontracting for construction and hires lots of temps – but at the mining sites themselves, definitely not the case. The actual grievance is that they are generally given one helmet to last for a year (or, at best, six months), and no matter how much it cracks, breaks, etc., they aren’t given a second one by the company. They have to buy their own as a replacement until the time interval expires. But to say that people go the first two years without helmets is just wrong – maybe (and I stress maybe) back in 2005, 2006, when the Chinese first came. But now, no way." His conclusion was spot on: "There are enough problems in the Chinese mines that you don’t need to fabricate/exaggerate like this." As I see and understand it, the Economist's article has endeavoured to cunningly mingle reliable information together with genuine lies. The purpose is to mislead the readers and sow suspicion on the Chinese as a whole. This is the Economist reporter's contribution to thwart China's presence in Africa. These two articles are pretty different. Peter Hitchens seems only interested in being sensational and selling papers and doesn't care where the truth lies (think of the News of the World or The National Enquirer). The Economist is better, but reporters are also products of their culture and times. Some real problems connected with the Chinese presence are mixed together with rumors and sensationalism and even mistakes, and not carefully sorted out (and as a product of his times, the reporter doesn't perhaps really care to sort it out). Besides, newspapers thrive on scary stories. If readers buy it -- because it also fits with their world view -- and don't demand the hard work of investigative reporting, why should newspapers care? I will start by saying that I am Nigerian and I stumbled on your blog by accident. I just want to say that I am a regular reader of The Economist magazine (or "newspaper") and I have come to accept that its coverage of Africa is just rubbish. What you call "errors" on the part of Economist reporters when reporting China in Africa are nothing of the sort. They are calculated deliberate attempts to incite Africans against China. I always laugh when I hear Westerners patronize Africans by mouthing sentimental words like "colonialism" and "neo-colonialism". Many of these Westerners are from countries whom our parents/grandparents engaged in peaceful demonstrations or violent armed struggle for freedom from centuries of militarized economic plunder and racist oppression. Surely, those westerners should know that we Africans are not "docile animals". If we feel that China is trying to "colonize" us then we will take action. Fortunately, the evidence suggests otherwise. Now, the Chinese state investors are not "saints", but they are certainly better than Western government officials who make emotional speeches about "democracy", "human rights" and "freedoms" before rushing off military weaponry worth billions of dollars to their atavistic, retrogressive, despotic, head-chopping and women-stashing royalist clients in the oil-rich Arabian Gulf. Africans are intelligent and many of us are increasingly understanding the geo-political game. It will take more than series of propaganda articles from western corporate media to divert us from the truth. I'm not sure why you stated the Economist exaggerated claims about the Luanda hospital, and the Lusaka-Chirundu road. This sort of thing happens all over in China all the time. What the...: "but rather than 'falling apart' in a few months, it developed significant cracks over the first four years, and closed for repairs in June 2010" - huh? Cracks often appear in new Chinese buildings only a few months old; 3 or 4 years further, the flat leaks and stinks, appliances and the toilet break, windows get mold, the flooring bubbles and peels, the paint flakes if you brush the walls, the cement washes away to reveal the mesh in places - and don't ask about the structural integrity in an earthquake. And we're talking about the initially nice-looking buildings with first-world priced condos. Many of these buildings will only last 20-30 years at most; some are so bad they're torn down after a decade. I even had a Canadian energy investor tell me his (then) 10-year-old son noticed how bad high rises in Xi'an were being constructed. Zambia has the edge to capitalize its mineral potential because the demand in copper will still continue to increase for more years not only locally but globally. However, mining companies are the ones that earn bigger than Zambia itself. Ben Bernanke recently said that Chinese currency manipulation "is blocking what might be a more normal recovery process." In fact, the problem goes beyond China to include many other emerging economies and even a few advanced economies. ... The evidence suggests that currency manipulators jointly have increased their trade balances by about $1 trillion relative to where they would have been in the absence of manipulation. Would you say the environmental, working and safety standards in Africa are higher than those of China? Is China making the situation worse? I have the impression that China is playing go/baduk/weiqi not only with Africa, but with the whole World. Once the match ends we will know for sure whether China´s presence in Africa and in the whole World is or not for good. I stumbled into your blog and want to genuinely praise your efforts. As you draw more attention, you will bound to find more and more of those appearing here accusing you of biased (yes for pointing out factual inaccuracies to complete fabrications) to you being a communist (you are lucky that you are not Chinese or they will diectly equal you with a paid communist, that is what liars do when they were confronted with facts). I would say this to them: if you only want to listen to one side of the story read the Economist, if you want to find out whether there are incorrect claims IN the Economist, read the Economist first then read the comment here. And for the guy asking you to point out lies in Chinese media, why doesn't he start his own blog? The Economist certainly did not think of it as their duty. After all, it does not take much to understand that the guy does not want to read the other side of the story, and has taken it as his own to force others not to as well, pretty democratic eh. Safari Journalism---Journalism which relies more on stereotypes of Africa than factual information. For example your detractors on this blog portray or assume Africans to be overgrown little children who cannot take care of themselves and need benevolent westerners to look after them and save them from the evil Chinese dragon. Africans are like a species of rare beasts about to be extinct and which only Western NGOs, Western media and Western government can save. LOL i'm not surprised the Economist is trying paint a biased picture. Just look at who their owners are and who's interest they serve. As Professor Chomsky pointed out when you read the media you really need to learn Martial Arts for self defense the Intellectual Self Defense to discern Facts from fiction to outright lies. A mixture is most potent. Aid tied system is what the West wants and insist on and we all know what that led to. Just look at the progress from colonial times till today. Of course China is not here to solve Africa's problem but the their Different Approach means competition. They understand the West Strategy of Maximize control of regimes and monopolize all the resources profit. Totally owned the Mines with zero profits going to the State except again very low preferential tax. The Chinese say we don't want to control your Political Process and offer a better deal with profit sharing or other ways to get the resources. What this means is Competition instead of Monopoly of the West that dictate harsh terms, control of Govt policy and interference of Independent Nations to act independently how best to develop their own country. So the African Govts are the winners that now have a choice who they want to deal with or who will give them a better deal. The opposition should focus on real issues such as oversight of the projects, how to protect their own industries or develop the industries by partnering with the Chinese, improve laws governing labor, improve project direction to schools, hospitals, crucial infrastructure. On Political Matter now isn't this up the the People of Africa to decide? Who are the West to decide on the fate of other countries? That's the problem with western media from 60 minutes to The Economist. Their agenda has been to paint Africa in as negative of a light as possible and it just so happens they also have a distrust of China. All this time I thought that Hospital in Luanda everybody brings up had eventually collaspe and never replaced. One free lance reporter who is a darling of western media has an obvious bias against the Angolan Government. He is prone to lies and exaggerations almost every time he writes a story about Angola. And he only writes negatives stories about Angola. This man literally makes up facts as though he uncovered the information himself. This man is simply real good at lying and will sound very convincing when he writes his stories. If you only read his articles you would think less think half of 1 percent of the population had benefited from the oil wealth and everybody else is getting poorer and Angola is becoming a Chinese colony. All of this is not remotely true but he has got a lot of people believing it. Now a crucial question on democracy and human right how is this related to development of crucial infrastructure, education and hospitals and highways? Isn't right to jobs human right? It means a way to feed themselves and get out of poverty. Isn't schools what people want? Do you even need democracy to have to find that out? Now the repression of Democratic rights is not the Chinese Policies totally unrelated. That is the Ideal that Africans themselves to decide. How to increase democracy is about accountability of Govt. Their own Govt. South Koreans kicked out their Dictator on their own due to Govt repression. It is up to Africans themselves to decide whether they want to kick out their Govt or otherwise how is this even related to China? All businesses look at a few crucial things before investing. Political Stability, investor protection and rate of return. If human rights and Democracy is the Gold standard in investing the why have the West Poured Trillions into china? Supporting Saudi Arabia, Egypt, Tunisia? The fact is Govt of the West is just using ideology of Freedom and Democracy but in deed just securing Investor Rights, Control of Regimes and ensure the status quo remains. Free Market is nothing but just Low Cost Economic Base to ship products back to their home country for Massive Profits is State Directed coordination of logistics What Trade is there? Or like Haiti forced to open their Rice industry to so called Free Market destroyed their ability to feed themselves. China on the other have identifies NDR to oversee their industrial strategy. Africa is well advised to follow this strategy. Understand what their Strategic industries are or crucial industries that must be protected and direct investments into proper sectors to develop their economy. That is not China's job but African Govt's responsibility to feed their own population and get out of poverty and develop their country. It is so glaring that China does not control African Govts and their presence meant with competitors around they can get a better deal and finally able to transform their country and set a vision for themselves and take charge of their own destiny without strings attached. Democratic Rights must be fought for and hold their Govt to account not bash a Country that provide investments with no strings attached. This is insane. Fight for better environmental protection, worker rights, basic infrastructure, education. But to attribute all these problems to China is unbelievable. Hold your own Govts in check. Ask them to get better deals, position the country to reap the most economical benefit and plan how to use those profits to develop social justice etc from your own Govt. Most amazing how Universal the problems of fathoming the dragon are! The commonalities paint a clear picture of Chinese FDI in Africa, As Africans, we must develop strategies to ammeliorate the problems, we are stuck with the dragon because the swan became extinct a long time ago! I am to the point where I am sick and tired people talking about that one Hospital in Luanda as an example of ALL Chinese consruction in Africa. There is a reason certain people keep going back to that one building is because that's all they got as a negative example. There have been hundreds of building built in Luanda alone, just one building had issues, and people then exaggerate the issues for that one building, implying numerous other buildings have issue when that is simply not true. The western media is seriously starting to lose credibility trying to create news instead of report the news. China has a huge problem to address in terms of this lack of hiring local labor. Governments let them in tot help create local jobs for home grown experts, not just bring in foreign talent. Before the West apologists try to make us forget, think of the days before the year 2000 when Africa was totally dependent on the West. Those days Africans had no hope. Does anybody remember The Economist arrogantly declaring Africa as a hopeless continent in the year 2000?